1696 Hudson Bay - Check Mate! This is a map by a French cartographer commissioned by a Dutch client to include descriptions of British settlements, and written in French! 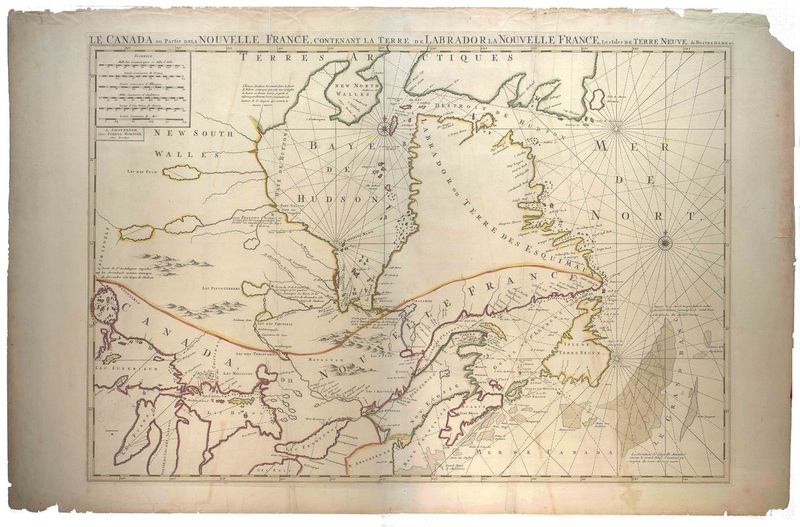 With a scale that includes Italian, French, German and English measurements, it appears to be a merchant map with wide appeal to various (international) business markets, such as the fur market demands in Britain – namely the Hudson Bay Company. This 1696 map indicates English (Anglois) fur forts along the shore of what is now James Bay. Some French forts built further up stream are noted. They were built to intercept the furs headed for the English forts downstream. The map indicates the French still in control of Port Nelson (York Factory). It is quite possible that Smithsend, Grimington and the Governers of the HBC could have obtained a copy of the map from Holland in advance of their 1697 planning. If they did, it would have increased their determination to reinforce their hold on York Factory (Port Nelson) retaken by Smithsend & Grimington in the summer of 1696. The 1697 English convoy was meant to reinforce this victory, whereas the 1697 Iberville naval task force was bent on recapturing York Factory and driving the English out of Hudson Bay forever!